*One high quality long bob wig streaked with multicolour stripes, magenta, turquoise, orange, blue... it's a rainbow of colour on your hair! Red and yellow and fluro green, purple and orange and blue. I can see a rainbow on your wig! 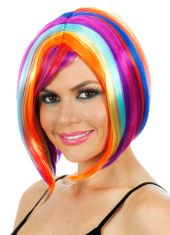 This Multicolour, rainbow bob Wig will bring flair to any outfit. Whether you're clowning or raving, or just want to grab some attention in a crowd, this high quality soft bob wig will feel great to wear and look even better!